Body Worn Insect Repellent Market size was worth over USD 592.4 million in 2017 and will witness over 8% CAGR up to 2024. Increasing preference to attain prevention from bug borne diseases such as Zika, Malaria, Chikungunya, and dengue impacting body worn insect repellent demand. Surge in mosquitos’ protection products purchase especially for underage kids, grown children and pregnant women are contributing a major market share. In 2016, WHO estimated over 445,000 deaths by malaria globally on comparing over 446,000 deaths in 2015. Moreover, 91% of total malaria deaths were recorded in Africa followed by South East Asia which accounted more than 6%. Malaysia, Thailand, Vietnam and Indonesia are major countries witnessing vector borne disease outbreak. According to Center for Disease Control (CDC) U.S., 47 out of 50 states registered mosquito borne disease including West Nile Virus (WNV), Eastern equine encephalitis (EEE) and Zika. California recorded more than 509 cases and 28 deaths, Texas registered 133 cases and 5 deaths, Arizona noted over 109 cases and 8 deaths by WNV in 2017. Brazil registered several types of vector-borne diseases, including Zika virus, Dengue, and Chikungunya in the 2015-2016 period. Over one million and a half population were directly affected by these deadly viruses. Government agencies have taken qualitative measure to protect from these diseases by promoting the usage of insect repelling products including sprays, creams, lotions, liquid, nets, and apparel are strong supporting body worn insect repellent demand. The U.S. government and Environment Protection Agency are positively promoting benefits of DEET as most effective insects and mosquito’s repellent agent presently. DEET is naturally found composition available in liquid, lotions, sprays and impregnates range such as roll on & Towelettes. Registered formulations are safe for direct application on human skin that contains 5% to 99% DEET compositions. It is safe for children, adults, pregnant women and old age adults due to no age limit for usage are driving body worn insect repellent market share. Increasing R&D regarding mosquito repelling formulation has led towards the usage of DEET and Lemon Eucalyptus in across various bug repellents products. Nowadays sprays have become a most suitable items of choices among consumer due to the easiest method to apply on skin and clothing. Companies are focused on increasing production along with extending the product range owing to the rising adoption of these products escalating body worn insect repellent market share. In certain cases, unhealthy instances noticed among patients such as breathing problem, skin itching & rashes, unpleasant odour by cream formulation, which may negatively impact demand. Aerosol sprays can cause breathing problems due to chemical droplets comes out of pressurized containers causes uneasiness in kid and women may hamper demand. Apparel insect repellent market is expected to witness over 7.9% CAGR up to 2024. The product includes safe clothing for fishing, tracking and campfire. Increased traveling population and scope of adventure tourism will drive product demand. Long sleeves shirts, T-Shirts, and head nets are in great demand from the last few years owing to one of the better and safe methods of protection. In terms of revenue, trousers captured around 17% market share in apparel segment in 2017. Prevention from body heat loss from exterior atmosphere, along with-it protection from mosquitos, ticks, ant, flies, and chiggers has influenced demand. The permethrin is primarily applied to trousers owing to excellent repellent that tightly bonded to the fibres during the drying process provides lasting effects for several days. The shirts are protected with DEET or Picaridin and excellent exposed clothing for prevention. A synthetic version of naturally occurring chemical permethrin is a knockdown insecticide, it repels skin contact. 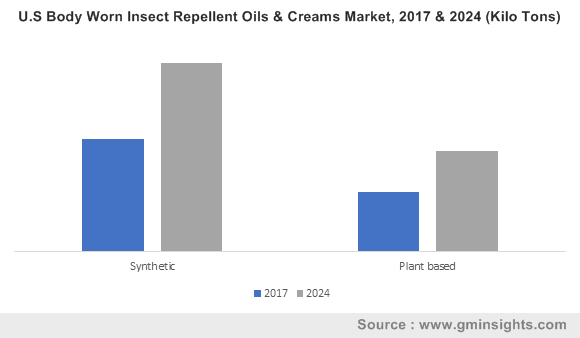 Insect repellent oils are creams market was valued over USD 200 million in 2017. These products are widely preferred owing to their good absorption rate in skin, which provides long lasting effects on the applied areas. DEET is actively used in repellent formulations for biting ticks and mosquitos. Ointments and cream formulations of lemongrass oil in different bases, oil in paraffin solutions are evaluated in tropical application. It exhibits more than 50% repellence lasting over 2-12 hours are supporting body worn insect repellent demand. Plant-based creams are specially formulated with essential oils such as lemon eucalyptus, citronella, lavender oil and soybean oil. Lemon eucalyptus oil was found most effective plant-based extracts in insect repelling formulations as compared to low DEET concentrations products are boosting body worn insect repellent market growth. Supermarket & hypermarket segment is projected to generate over 8% CAGR up to 2024. This segment holds a major presence in urban and semi-urban cities. The supermarket offers various variety of products in regarding product size and volume such as clothing, sprays, lotions, creams, and liquids under one roof. These channels provide hundreds of brands at economical price owing to their large bulk purchase and storage facility. The online store contributed more than 10% market share in 2017. This channel is considered to be the most convenient way of product purchase owing to the home delivery options. Online option also has a benefit of 24-hour purchasing option. Shopping through online portals provide price comparison with other brands along with availability of different payment modes. North America regional growth is mostly driven by the U.S. and Canada owing to large consumer population buying body-worn insect repellent products. In terms of revenue, the region accounted for over 30% of the share in 2017. U.S. government Environment Protection Agency is strongly supporting DEET usage in several bug repelling products owing to its excellent noxious property toward insects. Rising awareness among consumers regarding preventive measures to avoid diseases causing insects and mosquitoes biting are among major factors fuelling product demand in the region. Spreading vector-borne diseases such as West Nile, Chikungunya, Dengue and Malaria are among key factors boosting demand of body-worn insect repellent products. High prevalence of mosquito borne diseases mainly influence the demand for Asia Pacific body worn insect repellents market growth. The region holds very high potential for insect repellent sales due to increasing awareness regarding insect repellents among people. In 2017, with reference to International Monetary Fund, the Asia-pacific region showed the highest GDP growth rate in the world and is predicted to be the same in 2018. For South-East Asia, the overall year-wise funding for malaria reduced by 21% in 2016 as compared to 2010. Body worn insect repellent market share is consolidated in nature. 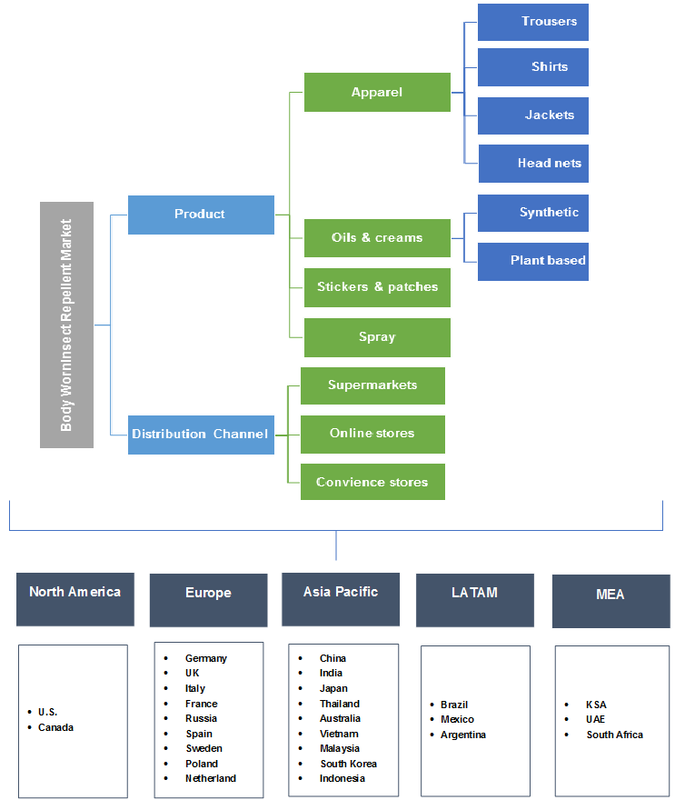 S.C. Johnson & Son, Spectrum Brands Holdings, The Coleman Company, Avon Products and Omega Pharma are among key players in the global body worn insect repellent market. The companies are involved in several strategies to gain competitive share in the industry share. Product innovations, portfolio expansions along with mergers & acquisitions, collaborations, supply agreements are the major strategies observed among the industry participants. Body worn insect repellent are substances applied directly on skin, clothing, or other surfaces to discourage tick, flies, and mosquitoes. These substances are excellent noxious effects to prevent biting instances and preventing diseases and viruses. Stickers & patches are most advance product line owing to presence microcapsules that creates strong aroma around body. Key companies are focusing on new product development for new born babies, as DEET products are not recommended for infants.